Let's plan together a diabetic daily menu plan. A good breakfast will provide you the amount of “good” carbohydrates you need for the day ahead activities. It's true that everybody loves to eat! 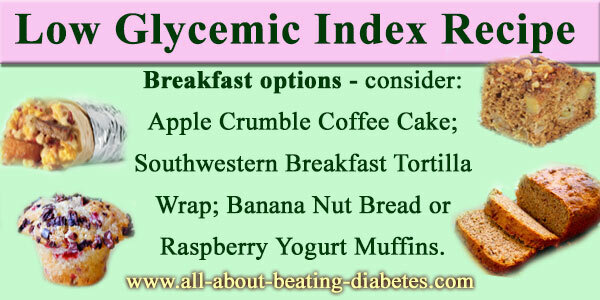 As a diabetic, you should interlace your gluttony with low GIrecipes to keep your blood sugar levels under control. As for breakfast options, you may consider: Apple Crumble Coffee Cake ; Southwestern Breakfast Tortilla Wrap ; Banana Nut Bread; or Raspberry Yogurt Muffins. Diabetics need to eat often and small portions of food for at least 5 times (meals) a day. To keep normal levels of blood glucose, and to avoid them going down, you need snacks. 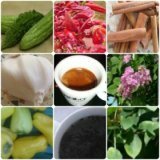 As healthy snack options you may consider: Confetti Tuna in Celery Sticks, nuts (almond, walnuts, etc), Turkey-Broccoli Roll-Ups, and some other options you may find in any cooking-book or by surfing online. If you eat your lunch using a variety of low GI dishes, for sure you'll continue being active and happy for the rest of the afternoon ahead. Your lunch options could be: Chicken Whole Meal Casserole Dish; Farmhouse Beef Casserole Dish, etc. Dinner options will depend on what you have had for lunch. So, if you had beef for lunch, you can go for chicken breast for dinner. Or, if you had pasta for lunch, go for rice or bread for dinner. It's up to you, but be careful to the portions sizes. You cannot permit to have large portions. What is more, try to have your dinner at least 3 hours before bedtime. That will help keep fit and avoid night-time hypoglycemia. Most of people consider dinner the most important meal time come after a busy day. It's not good thinking that way. It's better to consider lunch as the main meal of the day, because you have still time to be active. Meanwhile, if you have dinner, you will not have time to consume what you've eaten. That's why, it's good not to have a heavy dinner, since you'll do nothing than sleeping during night. You may have any snack for diabetics before going to bed if you see your blood sugar levels are low. Please do consult your physician for any specific problem you might have. and so on to keep your blood sugar and your body healthy.